Professor Tim Dixon from the School of Construction Management and Engineering discusses the importance of investigating the social sustainability of housing developments.In an era dominated by climate change debate and environmentalism there is a real danger that the important ‘social’ pillar of sustainability drops out of our vocabulary. This can happen at a variety of scales from business level through to building and neighbourhood level regeneration and development. Social sustainability should be at the heart of all housing and mixed-use development but for a variety of reasons tends to be frequently underplayed, and the English city riots last year brought this point back sharply into focus. The relationships between people, places and the local economy all matter and this is as true today as it was in the late 19th century when Patrick Geddes, the great pioneering town planner and ecologist, wrote of ‘place-work-folk’. In the current recession, where house-building has fallen to an all-time low in the UK, it is therefore not only important that we build more homes in the right place but that those homes link and integrate with existing communities. Two key questions stem from this: what exactly is social sustainability and how do we measure it? One way in which social sustainability can be understood is in terms of an outcome of place-making, or designing places that are attractive to live in. So social sustainability can be seen as being about people’s quality of life now and in the future, and describes the extent to which a neighbourhood supports individual and collective well-being. Social sustainability therefore combines design of the physical environment with a focus on how the people who live in and use a space relate to each other and function as a community. It is enhanced by development which provides the right infrastructure to support a strong social and cultural life, opportunities for people to get involved, and scope for the place and the community to evolve. However house builders have historically shied away from confronting how to measure what is seen by many as a ‘slippery’ concept. Despite this, the Berkeley Group recently commissioned research to assess and measure the social sustainability of four of its housing developments using an independently developed framework consisting of three dimensions: ‘infrastructure and social amenities’, ‘voice and influence’ and ‘social and cultural life’, which are underpinned by 13 indicators. Data from 45 questions tied into national datasets were used to underpin the indicators, and primary data was collected from face to face surveys and a site survey on the housing developments. The research is an honest and independent appraisal of one house builders’ new housing developments. 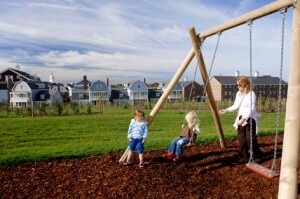 In the four developments (which were all in London and the south east) the research found that whilst people in the developments felt they belonged to the community, talked to neighbours regularly and planned to stay in the community, there were also negative feelings about feeling less like they played an important part in things and are less likely to pull together to improve the neighbourhood. Overall though, the developments scored well on well-being and safety compared with comparable places and national benchmarks. Recent changes to the National Planning Policy Framework, and the emergence of localism and well-being agendas have started to move social sustainability centre stage, and the next phase of this research is set to examine how new developments impact directly on the communities in which they are located. Long-term stewardship of housing developments is therefore likely to become increasingly important. Tim Dixon is professor of sustainable futures in the built environment in the School of Construction Management and Engineering. He also leads the new University of Reading’s Sustainability in the Built Environment (SustBE) research programme and is a research associate of the Walker Institute. His personal research revolves around the interface between the sustainability agenda and its impact on property development, investment and occupation. The research is based on a strong interdisciplinary approach which incorporates policy and practice impacts and futures thinking. The research (carried out by Social Life and University of Reading) on which this blog is based has recently been published by Berkeley Group in their report, ‘Creating Strong Communities’ (www.berkeleygroup.co.uk/sustainability/socialsustainability).